After an impressive showing of large-screen TVs, home entertainment products and even a curved smartphone at the International CES in Las Vegas this month, LG is setting its sights on the appliance space. While the brand’s connected whitegoods were the big story of the show, including smart appliances that can communicate using an instant messaging chat service, these products were more representative of what LG is capable of, rather than what it will bring to the Australian market in the immediate future. But speaking to Appliance Retailer about the Korean giant’s strategy in the home appliance space, LG Australia general manager, marketing, Lambro Skropidis said LG’s intention was to push to the top of the home appliance pack. “Our intention is to be a leader in home appliances,” he said. “In some categories we’re exhibiting the behaviour that’s necessary —in washing machines we’re number one and in refrigerators we’ve had unbelievable growth in 2013 — so we want to apply those same strategies and tactics into other categories. That test marketing has involved LG launching appliances into select retailers in order to test the consumer and retailer appetite for another brand in the cooking space. Some of the products on display at CES are already available to view and purchase in selected Harvey Norman stores, for example, and the brand has even tried its hand at ultra-premium products such as a $11,000 refrigerator. LG’s “Signature Kitchen” display at the 2014 International CES. While it’s been small steps so far, Skropidis said LG is hoping expand further “where we can expand the distribution, where we can get the consumer support”. And although the brand hasn’t been making a lot of noise in the cooking space, it has been taking advantage of its partnership with brand ambassador Matt Moran as a “spokesperson and endorser” for the range. 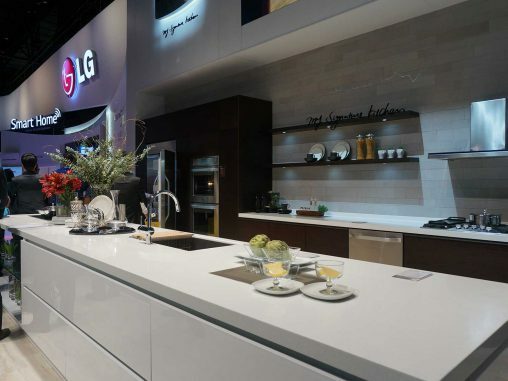 But it’s not just spokechefs and PR behind the range — Skropidis said one of the really strong elements of LG’s cooking line-up was the advanced technology that the brand was able to integrate into the appliances, thanks to its strength as a consumer electronics company with a strong R&D division. As an example, he pointed to the ‘Easy Clean’ enamel coating in LG’s high-end ovens, which was made possible thanks to company’s chemical division — a practical example of how the brand’s internal research was resulting in benefits for the end user. Rather than trying to compete with other brands that have a history in the cooking space, Skropidis said LG could use its tech savvy to gain a competitive advantage. “Strategically, that’s probably where it’s going to be interesting for us. We don’t have heritage in [the cooking] category. If you think about some of the long-standing brands, the European brands, what they bring to the party is heritage. And I think what we’re going to bring to the party is technology. While LG may be just dipping its toe into the busy waters of cooking appliances, Skropidis said the only way is up.